With a stay at Bridge To Peace in Tiberias (Tiberias Old City), you'll be within a 15-minute walk of Sea of Galilee and Tomb of Maimonides. This guesthouse is 0.6 mi (1 km) from Amdur Fine Gallery and 0.8 mi (1.2 km) from Tiberias Marina. For lunch or dinner, stop by The Golan Restaurant, a restaurant that specializes in kosher dishes. You can also grab snacks at the coffee shop/café. Mingle with other guests at the complimentary reception, held on select days. Wrap up your day with a drink at the bar/lounge. A complimentary buffet breakfast is served daily from 6:30 AM to 10 AM. Featured amenities include a computer station, express check-in, and express check-out. A roundtrip airport shuttle is provided for a surcharge (available 24 hours), and free self parking is available onsite. Featured amenities include laundry facilities, ATM/banking services, and an elevator (lift). Featured amenities include a computer station, dry cleaning/laundry services, and luggage storage. Free self parking is available onsite. With a stay at Astoria Galilee Hotel in Tiberias, you'll be in the historical district, within a 10-minute drive of Sea of Galilee and Tomb of Maimonides. This hotel is 1 mi (1.7 km) from Saint Peter's Church and 1.3 mi (2.1 km) from Amdur Fine Gallery. At Aviv Holiday Flat, enjoy a satisfying meal at the restaurant. Buffet breakfasts are available daily from 7 AM to 10 AM for a fee. Located 200 metres from the Sea of Galilee Beach, the Royal Plaza Hotel is in Tiberias. This hotel has an outdoor pool and a bar, and offers spacious rooms with seating areas. The rooms at the Royal Plaza are decorated in a modern style. Each comes with a fridge, kettle, LCD TV and private bathroom, and most have Sea of Galilee or pool views. A sauna and a hot tub are available in summer months and you can book sessions directly on site. Massage treatments are also available. The pub is open throughout the week. Mediterranean and Asian dishes can be sampled in the hotel's dining room. Tiberias’s Old City is 3 km away. Satisfy your appetite for dinner at the hotel's restaurant, or stay in and take advantage of the room service (during limited hours). Quench your thirst with your favorite drink at the bar/lounge. Buffet breakfasts are available for a fee. 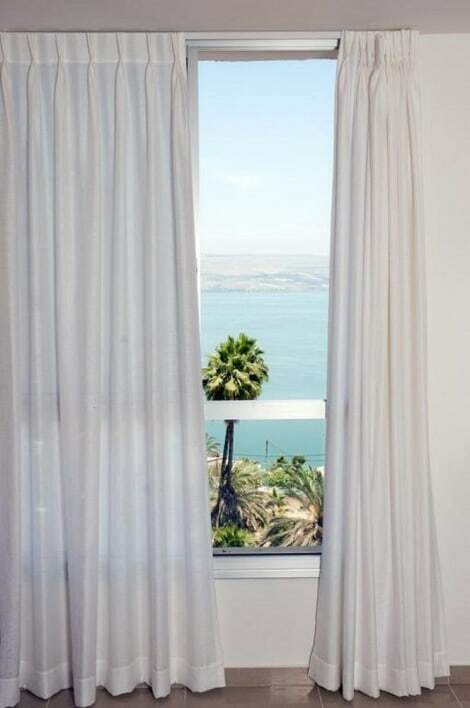 lastminute.com has a fantastic range of hotels in Tiberias, with everything from cheap hotels to luxurious five star accommodation available. We like to live up to our last minute name so remember you can book any one of our excellent Tiberias hotels up until midnight and stay the same night.